Pope Francis told the world’s top oil executives at a Vatican conference on Saturday that they must do more to convert to clean energy because climate change risks destroying humanity. Addressing up to 40 participants at the ‘Energy Transition and Care for our Common Home’ conference, including the CEOs of BP, ENI, ExxonMobil and Statoil, as well as scientists and investors, Pope Francis warned that “civilisation requires energy but energy use must not destroy civilisation”. The two-day conference was hosted by the Pontifical Academy of Sciences in collaboration with Notre Dame University. The conference marked the anniversary of the Pope Francis’s encyclical, Laudato Si, which was published three years ago in June 2015. 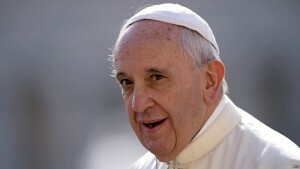 In the encyclical, the Pontiff appealed to Christians and people of goodwill to save the planet from environmental degradation and the threats posed by climate change. In his speech on Saturday, Pope Francis told delegates that climate change was a challenge of “epochal proportions” and said that the world needs to devise a way to produce energy that combats pollution, eliminates poverty and promotes social justice. He said modern society with its “massive movement of information, persons and things requires an immense supply of energy”. Yet as many as one billion people still lack a basic supply of electricity. “We know that the challenges facing us are interconnected. If we are to eliminate poverty and hunger … the more than one billion people without electricity today need to gain access to it,” he said. In Laudato Si, Francis warned of the dangers of continued over-reliance on fossil fuels as the primary source of energy. Scores of Catholic institutions, congregations and dioceses, including Caritas Internationalis, have pledged to divest from fossil fuels in recent years as part of a campaign steered by the Global Catholic Climate Movement.